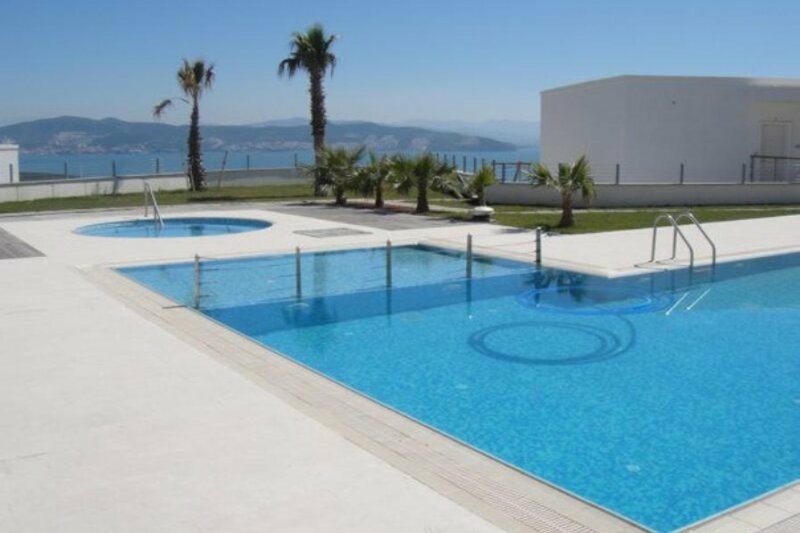 Situated on Horizon Sky Beach Resort near Iasos and Güllük, this spacious air-conditioned penthouse apartment has been furnished to a high contemporary standard and can accommodate two people in great comfort. The penthouse features a huge terrace with 180-degree panoramic views of a beautiful Aegean bay and surrounding areas. Inside, there's a roomy open-plan living-dining-kitchen area with two sets of French windows leading directly onto the terrace. The modern kitchen is equipped to a high specification, and the dining area seats up to six people. The luxurious living area has a 32-inch flat-screen TV, (which features a USB port, allowing guests to bring and watch their own viewing material). The apartment's airy bedroom also features French windows, which lead onto the terrace. The bedroom also features built-in mirrored wardrobe complete with drawers, and a spacious contemporary en-suite bathroom, with a bath and power-shower, and double sinks. The resort boasts a variety of facilities which currently include 7 outdoor swimming pools, children's play area, landscaped gardens, free Wi-Fi, friendly and helpful staff, an on-site shuttle service, and a small shop across the road to buy your basic supplies. There is an onsite café serving food and drink, and the neighbouring Port Iasos Marina also has a good waterside restaurant. Nearby Jasmine Beach has several tavernas set on a beautiful bay, (5 minutes by car, one of the taverna owners is happy to pick up/drop off Horizon Sky guests by arrangement), and Iasos has some great ancient Greek ruins that are well worth a visit. The resort’s free private boat transfer service operates from the neighbouring marina to and from the atmospheric local fishing town of Güllük, in which there are several dining establishments and bars, (which we would be happy to recommend), along with a decent-sized supermarket, pharmacies, bakeries, coffee shops, and several banks. Taxis and mini-buses may be taken to the nearby historic city of Bodrum from here, which has a buzzing bazaar, many ancient heritage sites, and multiple food and nightlife options. Güllük is also only 10 minutes away by cab from Bodrum Airport, (a one-way journey costs approximately 45TL), so guests are able to make use of the private boat service when arriving at or departing from the resort. The seasonal timetable is provided when guests book. Resort currently has 7 swimming pools, including the main split-level pools with waterfall.